That’s how the story of the most international cookie started. 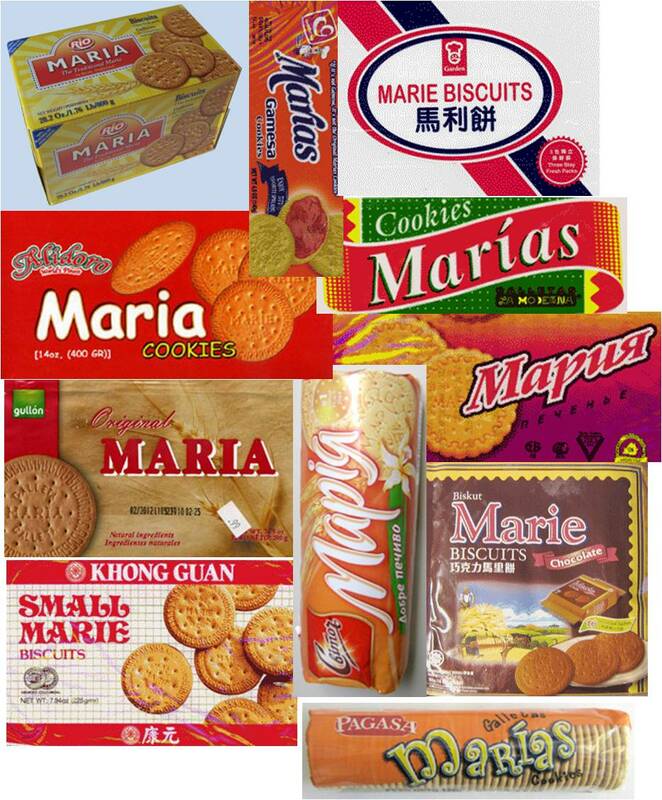 From England and Russia, to the Philippines, India, Mexico and Puerto Rico, today half of the globe considers Maria cookies a household staple. They are manufactured and sold by multiple companies around the world. In Spain and South Africa, they represent more than 40% of all cookies sold. The cookie was first created in 1874 by the English baker Peek Frean. He created a thin round biscuit on which he engraved an intricate border, believed to be a traditional Russian pattern, and the name Maria, in honor of the Grand Duchess Maria of Russia. Her festive wedding with Alfred, the Duke of Edinburgh caught Europe’s fancy (According to LaTienda.com). The cookie became popular and was soon copied by other bakers and spread throughout Europe. But how it toured the whole world and kept its original look and recipe almost intact for over a century is somewhat of a mystery to me. European colonial powers will have something to do with it and so does globalization. But it has to be that light but flavorful recipe that captivated palates across the globe with its simplicity and understated sweetness. At first sight, Maria cookies may look bland, but once you take a bite, the delicate mix of vanilla and caramel have you hooked forever. I can’t believe I knew nothing about them before coming to America. Some Spanish friends introduced me to Marias. In my first months here, they were one of those very special finds (in the Latin food section of the grocery store) that helped me feel closer to home as they somewhat resembled the very popular “simple” cookies we have in Bulgaria. Today, Maria cookies have become a staple in our house as well. For me, just plain, they are a perfect companion for tea or coffee. I often daydream of a rainy day when I would curl up on the couch with a good book, a big cup of tea and a plate of Maria cookies. And when I have a craving for something sweeter, Maria sandwiches with Nutella make for the most satisfying and easiest dessert ever. Some of my Mexican friends make cakes with layers of Maria cookies or crush them with cinnamon, sugar and butter in a pie crust, but I am still to explore that. 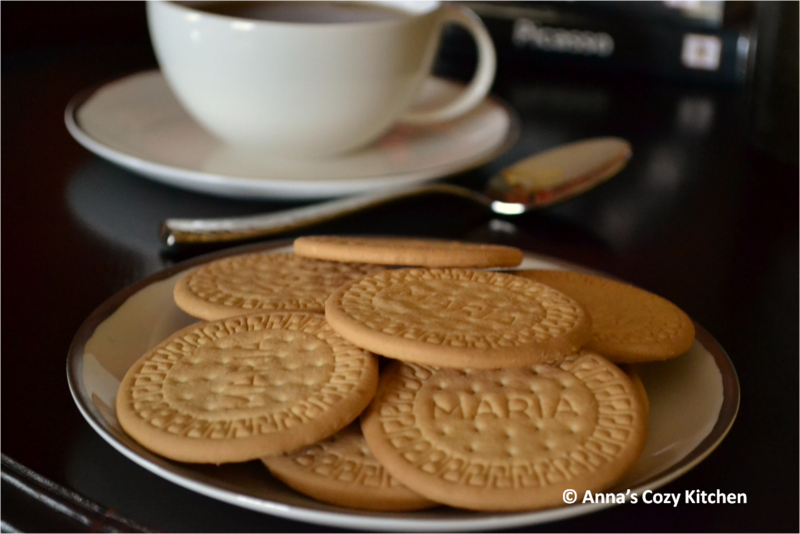 Are Maria cookies a staple in your house? Did you know how far back their story goes and how popular they are around the world? What is your favorite way to enjoy them? This entry was posted in Cookies, Kitchen Chats, Sweets and tagged Biscuits, Coffee, Cookies, Cookies Maria, International, Mexico, Nutella, Russia, South Africa, Spain, Tea. Bookmark the permalink. I love a story like this — thanks. It gets my imagination going. Also, thanks for the tip about Maria cookies. I’ll look for these in the Hispanic section of my supermarket. Maybe these cookies would also taste good with dulce de leche from Argentina. Susan, dulce de leche is a great idea. I’ll try that too. I am really fascinated by the story of this cookie as it has spread around the world completely virally. Of course, there were companies that marketed them but not a single major multinational is pushing it globally, yet half of the world loves them. Oooh Galletas Maria !- que rico! I have not heard of Marias before… but now I must find them! Yum. I am pretty sure that they’ll have them in your Wally World, in the Latin section. I find them in Kroger in my neighbourhood. Do you know if Maria cookies have any almond extract? Almonds itself or almond flavoring of any kind? I have allergy to almonds and im itchy all over. Just making sure if they are any?